Tiny homes, or accessory dwelling units, could solve two housing problems that plague U.S. cities: affordable housing shortages in major metros and housing for aging Baby Boomers no longer able to live alone. In the Tampa Bay area of Florida, affordable housing may be difficult to find, but plenty of pools have their own homes. 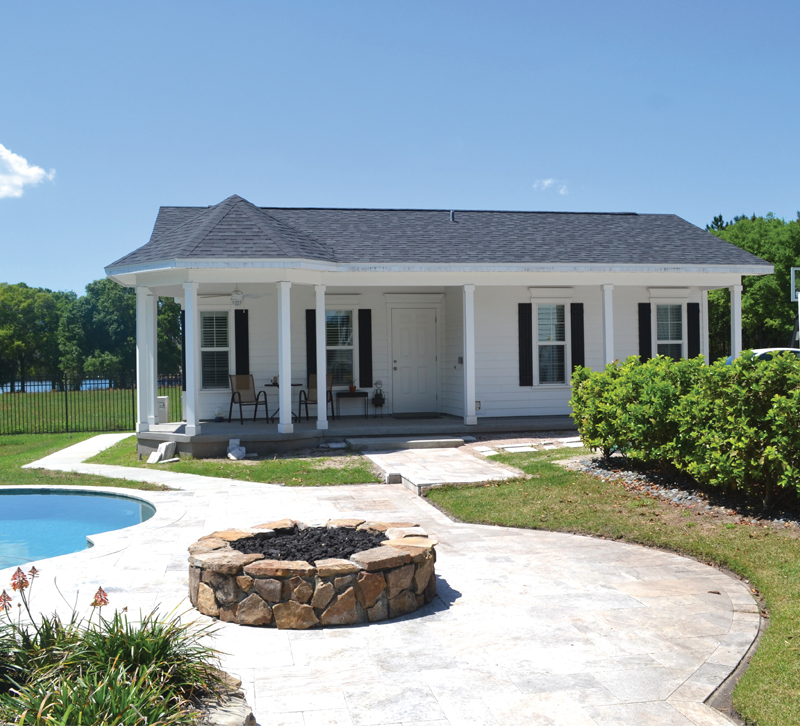 As a general contractor and President and founder of Goldsborough Company in Tampa Bay, Henry Moseley Jr. has built plenty of pool and custom houses and restored historic homes over the course of his two-decades-and-counting career. So when his good friend asked him to build a pool house in 2001, Moseley gave him a pool cabana with two store rooms. As his friend’s needs changed, so did the pool cabana, which moonlighted as a playroom and an exercise room. Ten years later, Moseley’s friend’s grandmother-in-law fell and injured herself, and she could no longer live alone. The friend and his wife brought the grandmother-in-law to live with them, but the grandmother-in-law still felt a little unease. She worried she was imposing on her granddaughter’s space and that she might disturb the others in the home when she got up to use the bathroom in the middle of the night. Moseley Jr. opens the door to a Home Care Suites Casita. Though many have brushed them off as a fad for Millennials, tiny homes — or accessory dwelling units (ADUs) as they’re more formally called — stand poised to solve two major housing crises in cities across the country: the struggle for more affordable housing and the eventual wave of retired and aged Baby Boomers who cannot physically live or afford to live by themselves. In Tampa Bay alone, the share of low-income renters grew by 35 percent over 10 years despite the number of households increasing in the city by only 13 percent, according to a November 2017 Tampa Bay Times editorial. By 2035, one in five Americans will be over the age of 65, as well as one in three heads of house, says the Harvard Joint Center for Housing Studies. As housing and healthcare costs continue to rise, ADUs may provide a win-win-win: affordable housing in major cities, comfortable living for aging Boomers and caregiving assistance for adult children. As Americans moved out into the suburbs in the 1950s and 60s, most neighborhoods across the United States prohibited ADUs to control the population density in the areas, basically preventing the suburbs from becoming as crowded as the cities. People continued to build ADUs — although they were considered illegal — in their homes (renovating an attic or basement) or building a structure onto their home (an attached structure beside or behind the home or above an attached garage). Fewer people built detached ADUs as they were less conspicuous. By 1960, San Francisco had 20,000 to 30,000 ADUs, but 90 percent of them were built illegally, according to a 2008 report from the U.S. Department of Housing and Urban Development. The defense boom created by the war drove people en masse to the Bay Area, and as housing prices in San Francisco today show, a need for affordable housing in the area persists. Now the city has changed its attitude toward ADUs, and architects like Carrie Shores of Bay Area-based Larson Shores Architecture and Interiors see them as great solutions. In 2016, San Francisco created an ADU program that would allow for ADUs citywide in zoning districts reserved for residential uses. Right now, Shores says her firm has 10 ADUs or in-law suites (ADUs specifically designed for aging-in-place) in the design or construction process. Denver, another city struggling with affordable housing, changed its zoning laws in 2010 to allow ADUs to be built in some neighborhoods, provided the community permitted them. Tomecek, founder and Principal at Tomecek Studio Architecture, hasn’t built any in-law suites just yet. His clients come to him wanting to add a rental space to their properties or to just enlarge them with an ADU, but he may have more work coming. The West Denver Single Family Plus initiative, led by West Denver Renaissance Collaborative and community leaders to combat involuntary displacement in the west Denver neighborhood, includes an ADU pilot program that will help “qualified homeowners design-finance-build an ADU.” According to The Denver Post, the initiative could add 250 ADUs to west Denver. The project is scheduled to launch late this summer. In Florida, Moseley describes his ADUs as the “quintessential cottage.” His projects range in square footage from 250 to 900, but his 400- and 500-square-foot units have been the most popular, and his clients have primarily been daughters building units for their parents. Shores says about half of her clients are aging-in-place parents who want to be closer to grandkids, but a growing number of clients want to use ADUs as rentals on their properties and as homes for their young adult children facing astronomical San Francisco rents. Most ADUs take about five to six months to complete, although that doesn’t include the time spent bringing the client on board, which can take longer if their client is less responsive or needs more time to make decisions. Both Moseley and Shores have predesigned plans that clients can choose from, and they also work on more customized plans depending on what the client wants. Tomecek works collaboratively with his clients to create ADUs that fit the properties. Most clients contact Moseley through an online form, which helps him and his team understand what the client wants and whether it will be possible to deliver. 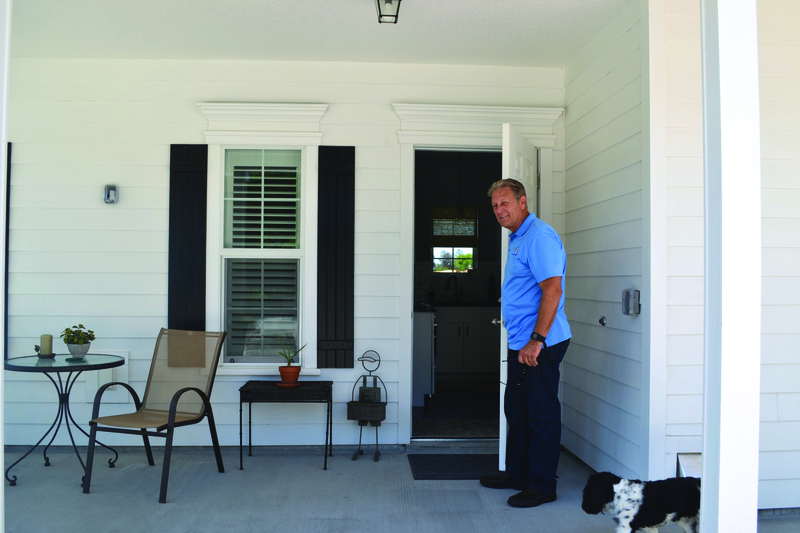 Having worked in the area for decades, Moseley knows the zoning codes and minimum and maximum sizes allowed for ADUs like the back of his hand, and he can easily tell whether a client’s requests are doable or not. Assuming all goes well though, his design process takes about three weeks to finalize and acquire all the permits necessary. Then the construction can begin. The kitchen in a Casita from Home Care Suites. Though the ADUs may be tiny, architects do have ways to open the spaces and make them feel less cramped. Shores’ clients prefer separate, closed-off bedrooms on the main floor rather than a loft, which can make the space feel more like a studio than a tiny home. She also uses vaulted ceilings and well-placed windows to make the space feel more open and airy. Tomecek’s clients pour most of their dollars into kitchens and furniture. In Florida, Craftsman-style homes remain popular, and most of Moseley’s clients want their ADUs to look similar to the main structure. 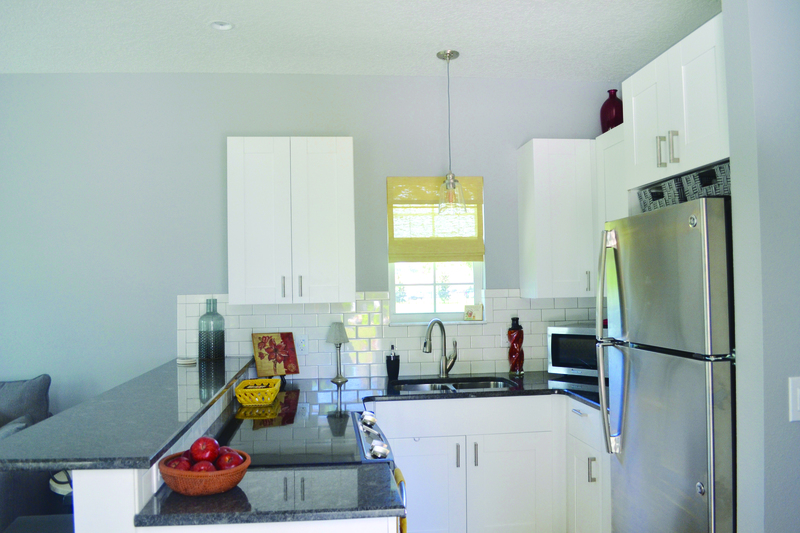 Inside, clients tend to opt for granite countertops and higher-end fixtures. Moseley says he recommends his clients use Houzz and Pinterest to think about how they’d like to decorate. In theory, ADUs seem like the perfect solution to solve problems from involuntary displacement to caregiving. But even though ADUs can be connected to the main structure’s power and plumbing, they’re not cheap, and they won’t be a one-size-fits-all solution. In the Bay Area, Shores tells her clients to expect to pay about $500 per square foot. In Denver, the cost is between $250 to $350 per square foot, and in Florida, it’s about $200 to $210 per square foot. Moseley’s most popular design — a 400-square-foot ADU with a 65- to 85-square-foot porch — costs about $85,000. Not exactly a small investment, which is why he makes sure he’s upfront with all his costs so clients know exactly what they’re paying. 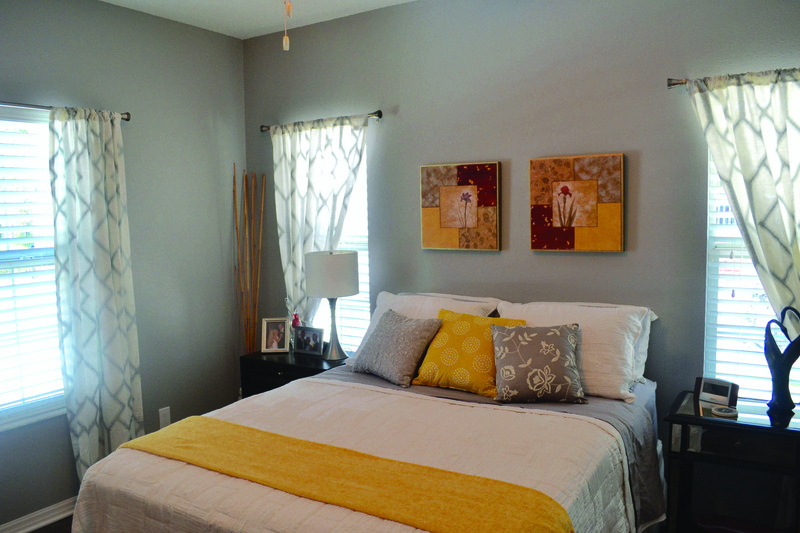 A bedroom in a Casita from Home Care Suites. Building material and labor costs play a major role in the cost of an ADU, and the prime locations make them more expensive in some areas than others. That cost may be what drives more ADU adoption. The median cost of a one-bedroom in an assisted living facility in the United States is between $3,500 and $4,000 per month, and at this time, Medicare won’t cover those costs. Just over two years of paying for a one-bedroom would cover the cost of Moseley’s 400-square-foot unit. In Florida, Moseley says taxpayers can get a waiver on their taxes if they have an elderly person living in a space on the property, and in California, Shores says homeowners often take out an equity line on their homes, pay for construction, and then make the money back quickly in rent. Both methods can offset some of those costs, but Medicare doesn’t cover the costs of ADUs either. There’s also the hurdle of convincing aging parents to move onto their adult children’s properties. One of Moseley’s almost clients — a woman looking to build an ADU for her parents — had to abandon the project when her mother got sick and her father got cold feet about it. Meanwhile, the responsibility of caring for the parents fell on the daughter. A 2016 AARP report estimates that family caregivers — those who take care of elderly loved ones in their families — spend about 20 percent of their annual income on costs related to caregiving, and that’s not including the incalculable emotional costs. For Moseley’s friend, the in-law suite provided his grandmother-in-law with privacy and independence and the family with peace of mind. The grandmother-in-law eventually moved to an assisted living facility when she needed more attentive care, but Moseley’s friend had been able to give her five more comfortable years. Greater access to affordable housing and ADUs could potentially benefit people of all ages no matter where they’re living. The tools are out there. Now it will be up to cities and communities to help future generations realize their American Dreams and let others finish theirs in dignity.